TFGN-II-C912-360 has 9 needles, 12 heads, needle sizes 9 - 18, tension & stroke adjustment, optional auto bobbin changer. 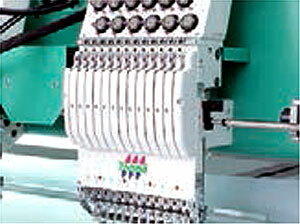 Tajima TFGN-II-C912-360 9 Needles 12 Heads Cylinder Embroidery Machine. The TFGN series is Tajima's high-end flagship model. Recently updated for high productivity and higher added value. The newly designed middle thread guide halves the thread setting time for one needle compared to conventional Tajima parts. Thread tension may be set easily. Needle Sizes 9 to 18. Since needle sizes from #9 to #18 can be used, the applicable thread variety from thin thread to thick thread has expanded dramatically. 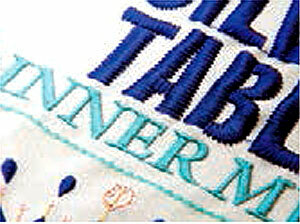 When the thick thread replacing parts kit is used, thick thread embroidery can be done easily. The thick thread parts kit is attachable/detachable by one-touch operation. Furthermore, when some refinements are added to the design data, more unique, higher value-added products can be produced. 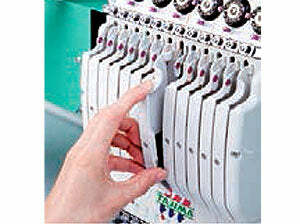 In order to keep up stable quality, thread condition should be adjusted according to thread type, fabric and design. The tension and stroke of the thread take-up spring, which have been adjusted for each head, can now be adjusted for each needle bar. Since the adjustment can be made according to thread type and stitching method, product quality can be further enhanced. 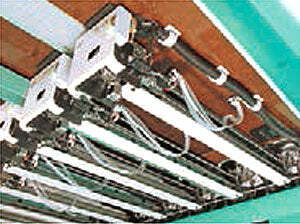 The Bobbin Changer II is a factory option that allows the bobbin threads of all heads to be replaced simultaneously. 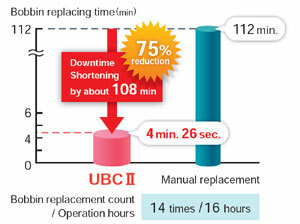 The automatic bobbin thread replacement has substantially saved time, improving production efficiency to a great extent, and drastically decreases the work burden on each operator.